Have you ever suffered from theological burnout? I have – notably when studying for my biblical counseling certification. One hundred eighty-five hours of video lectures were tremendously helpful and informational; so were the many books I had to read. By the end, saturated in hermeneutics and systematic theology, I didn’t feel like opening the Bible anymore. I felt like God was an algorithm to be approached through diagrams, charts, and verses committed to memory. He seemed as distant as my college chemistry professor (who I haven’t seen since 1990). There was nothing wrong with the training, of course. A correct understanding of God, human nature, and the Bible is critical in order to understand the issues we deal with in the counseling room (as well as life in general, for that matter). All of the books and training materials I was assigned were produced by Calvinistic authors, as biblical counseling tends to be very heavily Reformed. Reformed literature, by and large, tends to be heavy. Richly doctrinal but not a quick read. There is less emphasis on God’s love and relationship with us than on His other attributes, and to be honest, many times the continual emphasis on exegetical skill (not to mention total depravity) left me cold. Christ Might Have Died for my Sins? Don’t get me wrong; the Reformers were the heroes of the faith who rescued Christianity from the mysticism and superstition of the Dark Ages. The Reformed camp, on the whole, produces the highest quality Christian literature there is; particularly in the Christian counseling genre. Sometimes it has seemed to me, however, that in the quest for doctrinal precision and endless parsing, the relational aspect of Christ’s love is lost. Taking an extreme position on the Doctrines of Grace can leave one scratching one’s head. Doesn’t have the same ring to it, does it? Jesus looked at the Rich Young Ruler (Mark 10:20-22), loved him, and bid him come and follow Him. And the guy still walked away (which I find staggering). Repeatedly, we see that the invitation is open to all…we all have a chance to be one of “the elect”. We need to hold onto this truth, and not confuse counselees into thinking they can be arbitrarily ‘locked out’ of heaven by a misunderstanding of predestination. We need to give hope, not seek to be more Calvinistic than Calvin. Overwhelmed by Theology, or Overwhelmed by Love? Having a high view of God precludes focusing on our own “felt needs.” It is unbiblical (some would say blasphemous) to think in terms of our own value. I understand and agree that we are totally depraved, and the Atonement speaks of HIS infinite worth, glory and value, but there are several places in Scripture where God’s Word indicates that we are precious to Him. If we were truly worthless to God, He never would have sent His Son. I can see where there’s a danger to making the cross all about us, rather than about God (and people do); but even the Puritans recognized Christ’s love for the individual. I agree God does not exist to meet our emotional needs, but what do you do when you have a tough day? What do you teach your counselee to do? Or do Reformed folks never have a tough day, because of God’s majesty and sovereignty? Do we pour our hearts out to God, or do we text a friend, who seems more approachable? Does this read as if it were written by someone who saw God as distant, obscure, or harsh? Far from it. The beauty of some of the classical writing of the Puritans (and other early Reformed writers, such as Spurgeon) is that they maintained that balance between holding a high view of God’s majesty, and enjoying an intimate relationship with Him. Humbled by His interest in their lives, the desire to know Him in spirit and in truth fueled their deep study of His Word. Far from seeing theology as dry or irrelevant, we may think of these early Reformed writers as the original biblical counselors. It took me a long time to get back to reading devotionals after completing my certification. I got the impression from my courses that devotionals are considered “fluffy” and generally promote bad theology. The answer is to find truly good devotionals – writing that spurs one on to seek God more, and to go deeper in our walk with Him. We needn’t suffer from ‘theological burnout’ or view Reformed/biblical counseling literature as dry or overly heavy-handed. The answer, for me anyway, was to drop the intellectually-induced guilt over not always having a desire to peruse concordances, categorize passages on index cards, or learn koinos Greek. Of course, if one has the time and desire to do this, by all means she should! Proper interpretation of the Scriptures is not optional; and I have taught on this very subject many times. But there comes a point where the human heart wants to put down the books, and just spend time with the Father. We biblical counselors can easily get out of balance when the very thing we use to know God – doctrinal study – can stand in the way of desiring fellowship with Him. Simply being on guard against this trap (and being honest with ourselves about how we wish to spend devotional time with God) is crucial to our spiritual health, which in turn makes us able to minister to others. [i] “Seasons of the Heart”, compiled by Donna Kelderman, Reformation Heritage Books, 2013. While undoubtedly well-intentioned, this sort of advice targeted towards Christian wives concerns me. It is not about the housework or a division of labor based on traditional gender roles. That is an individual arrangement that can be decided by couples based on preference. If a husband does not feel it is his role to give the baby a bath, fine. If she does not want to mow the lawn or snowplow the driveway, that is reasonable. However, as another reader pointed out, the quote seemed to imply that a woman who is honestly overwhelmed is sinning if she asks for help. She is not. Many women fall into serious depression because they are overwhelmed by the demands of running a household (often while homeschooling children) and are made to feel guilty if they expect assistance from their husbands. Would we tell men they are wrong to expect their wives to cook their dinner? Iron their shirts? Meet their sexual needs? It would be hard to find a male writer willing to take this stance. Even so, household chores are not the main issue I had with the quote. It is the notion that in a relationship, it is wrong to have any expectations of the other person. The Bible sets forth some very clear expectations for both husbands and wives – they are to love and submit to one another (Ephesians 5); he is to be patient and gentle with her (Colossians 3:19; 1 Peter 3:7); she is to be industrious at home and assist with running the household (Proverbs 31); not contentious (Proverbs 25:24). He is not to be a drunkard (1 Cor. 6:10 and elsewhere); both are to be sexually faithful to each other (Hebrews 13:4), and the list goes on. 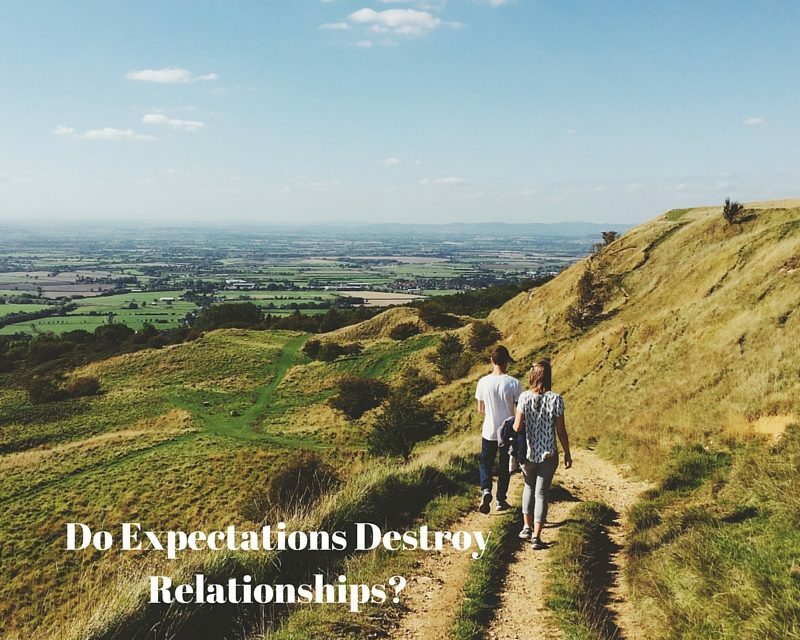 God has set these expectations – why would it be wrong for either spouse to hold them? It would be extremely unhealthy to enter into any kind of relationship with no expectations whatsoever, but particularly into a marriage covenant. Telling women “You won’t have a happy marriage if you expect anything from your husband” is dangerous for at least three reasons. First, it demeans men. A godly man seeks to honor and obey God by loving, serving, protecting, encouraging, comforting and helping his wife. He is the spiritual leader in the home, and is the one to whom his children look to see an example of Christ. It is rather condescending (if not insulting) to tell women to “expect nothing” of them. Lastly, telling women to have zero expectations in the marriage relationship opens the door to abuse. I have written about this before, and I firmly believe that sanctimonious messages like this contribute to the problem. The implication is that the woman is somehow responsible for any failings in the marriage; that it would all go so much better if she would just be a better “helpmeet” and stop expecting her husband to obey God. When women internalize such unbalanced messages, they are less able to recognize emotional abuse and the Church, by extension, continues to perpetuate the cycle. “Doormat theology” is not biblical. While it is certainly not correct (or realistic) to marry expecting perfection of one’s spouse, a healthy regard for the other’s spiritual well-being (as well as that of future children) demands a certain set of expectations. That is, in essence, what the marriage vows are: a commitment to live up to one’s God-given responsibilities (including to love, honor and cherish one another). If a woman does not expect at least this much of her husband, the relationship is already in serious trouble. Expectations do not destroy relationships. Selfish people destroy relationships. The most important relationship men and women can ever have is with their Creator, and Christ Himself laid out some very clear expectations on His followers: “If you love Me, you will do as I command” (John 14:15). He expects us to live up to what we have already attained (Phil. 3:16), and part of this means behaving in a selfless and Christ-like way in our relationships with other people (most of all, our marriage). Failing to have any standards or expectations in a relationship, on ourselves or other people, is a sure-fire way for it to fail. 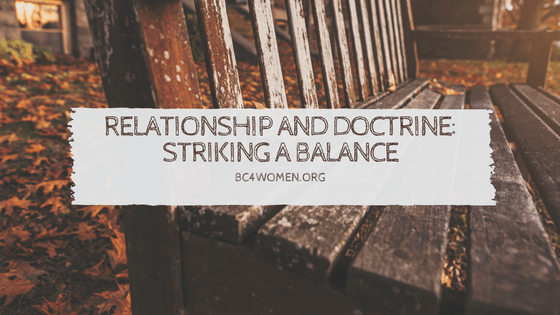 God has given us the standard of what a healthy relationship should look like, and women need to work toward what God has called them to do – while expecting no less of their husbands. Do I Want to be “Makarios”? Practically speaking, the fifth chapter of Matthew is one of the most difficult in the Bible. While the theology behind the Beatitudes and Christ’s instruction on how His followers are to conduct themselves is not difficult to grasp, the unattainable standard of holiness He sets forth in this passage has endless implications to the Christian’s personal life – as well as discipleship in the counseling room. The Beatitudes are counter-intuitive, because some of the states of being Jesus is calling “blessed” we would instinctively avoid. We might be ok with being gentle; and we certainly like to think of ourselves as hungering for righteousness, but mourning? Being persecuted, or slandered? Poor in spirit? What’s “blessed” about that? The word used for “blessed”, makarios, does not mean “blissfully happy or contented.” Also used seven times in Revelation, (and twice to describe God in 1 Timothy), Jesus is after something much more than temporal warm, fuzzy feelings here. Makarios , from the root mak (large or lengthy), and denotes “the nature of that which is the highest good” (Vine’s Concise Bible Dictionary) and referred in Greek both to the state of the gods, or later, to the upper crust (elite) of society who had achieved material blessing presumably by upright living. Now, Jesus pronounces God’s blessings on the lowly: The poor, the hungry, the thirsty, the meek, the mourning. He reverses our understanding of what it means to be ‘blessed’. The elite in God’s kingdom, the “makarios”, are those at the bottom. Is this what we want when we sign on as Christians? Throughout the Gospels, Christ makes the cost of discipleship clear. However, Matthew 5 is a concise glimpse not so much at entrance requirements for outsiders; but a declaration of a present reality – what already characterizes the true Christ-follower. Each of the beatitudes is characterized by a type of humility. Perhaps Jesus’ opening statement, “Blessed are the poor in spirit,” is the most intriguing – what does it mean to be poor in spirit? Why would I want to be poor in spirit? What is He getting at here? Spiritual poverty, like material, is characterized by a lack – not having something. Someone who is truly poor, like the beggar of Luke 16, is utterly incapable of helping himself and is awaiting crumbs. Spiritually bankrupt and without anything to offer before our Creator, God values those who seek Him realizing they have nothing of their own merits to offer. Being “poor is spirit” means being able to sincerely say, like the Pharisee of Luke 18, “Have mercy on me, a sinner.” It is the opposite of resting in one’s spiritual pedigree, good works, or ministry accomplishments. It is the beginning of the understanding of grace. When beginning discipleship with a new believer, or counseling for a specific issue with a more mature Christian, this is a good starting point. Most of Matthew 18 (and Christ’s instruction to His followers generally) hangs on this first statement – recognizing our own spiritual poverty and brokenness is the beginning of a relationship with God. The question we need to wrestle through then becomes, “Is this something that I really want?” The problem is, if we are honest, we want some of the glory for ourselves. Of course, we want to be counted as Christians; but how do we really react when mourning – does it challenge our faith, or do we count ourselves ‘blessed’ to have the God of all Comfort on our side? After demonstrating His priority on humility in the first part of the chapter, Jesus turns His attention to interpersonal relationships. This is where meekness and Christ-like humility is truly put to the test – it is easy, after all, to be meek, humble or gentle if living on a desert island (or in a convent). But in the messy world of jealousies, rivalries and petty gossip, can we really “rejoice” for being persecuted? Or, if provoked to anger, are we able to see that as seriously as murder? Christ is after heart attitudes here, demonstrating that anger and lust are as serious before God as their logical conclusions (murder and adultery). What’s so difficult about this chapter is that no one is capable of living up to this standard – apart from Christ Himself. It continually reminds us that our thoughts are as loud in heaven as our shouts, and that God expects our responses to be rooted in humility. Often, people are suffering because of someone else’s sin. When someone continues to hurt us without remorse, it is almost impossible not to want to strike back. This is a good starting point in counseling (including counseling ourselves) to deal with the sting of betrayal or being slandered. Praying for those who persecute us and loving our enemies is the hardest thing Christ has ever called us to do, but He declares it our greatest good. This is His definition of what it means to be blessed, although it is an intangible and often unappreciated blessing to us in this world. Taking a close look at how God defines blessedness (versus the short-sighted way we often see it) will help us and our counselees redefine our priorities and gain the mind of Christ (1 Cor. 2:16). On June 3rd , a “feel-good” movie designed as a ‘dramatic romance’ opened in cinemas nationwide. Being somewhat out of the pop-culture loop, I first heard of it when a European friend posted a disability rights activists’ petition to boycott the film on social media. The main character in “Me Before You”, Will Traynor, is an extremely wealthy, good-looking, educated British man who is left a paraplegic by an accident. Despite having a loving family, access to the best rehabilitative therapy, and a devoted caretaker, he decides to end his life at Dignitas, a Swiss euthanasia clinic. “Make no mistake: Quadriplegia is hard, and it can be tempting to give up. Like Will Traynor, the paralyzed heartthrob in the movie (played by nondisabled actor Sam Claflin), I rely on constant assistance from paid aides and family members. It’s nearly impossible to find a job, let alone a restaurant or store without steps or with an accessible restroom. It’s a good thing I’m positively bursting with self-confidence and know I do want my life to continue. But how many of those who are struggling to maintain self-esteem, who feel unsure of their right to exist, possess the courage and sheer chutzpah to withstand the invidious message that they’re better off dead?” (Emphasis mine). 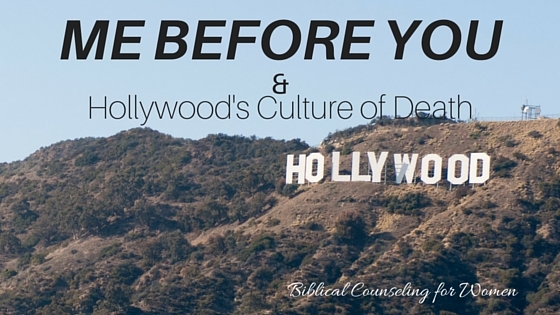 Hollywood’s morbid fascination with euthanasia is not new. Me Before You is eerily similar to the 1981 film, Whose Life is It Anyway?, which also depicted a post-accident quadriplegic determined to end his life. However, two stark differences stand out: in the earlier film, the hospital administrator staunchly opposes the main character’s decision on moral grounds. In 1981, it was considered acceptable to “put to sleep” one’s aging dog; but mercy killing a human being was still a moral taboo. Secondly, the earlier film was dark and serious. Me Before You is a product of Hollywood’s modern ‘culture of death’ which has been so white-washed that comedies are made about abortion (2014’s “Obvious Child”; 2007’s “Knocked Up”); and now we have a feel-good romantic drama about euthanasia. American movies, unfortunately, are the unrealistic standard by which many young people worldwide set their moral compass. Whether we want to admit it or not, impressionable students are debating the relative morality of euthanasia versus quality of life in medical schools around the world – largely because it has become a “gray area” in American culture – in less than one generation. Hollywood has a tendency to grossly misrepresent and inaccurately portray entire people groups (such as American evangelicals in Soul Surfer; now the disabled in Me Before You); but people in other countries really believe our films represent American culture. (Case in point: just try and convince a Bulgarian teenager that American teens don’t all drive sports cars and carry Gucci purses, ala Mean Girls). Wait, WHAT?? They were more concerned with cleavage, “shirtless men in a few scenes,” betting on horses and swearing than with the glorification of suicide? When a shirtless man concerns us more than a suicidal man, our ‘Christian priorities’ are out of whack. Every suicide is a tragedy. What Hollywood doesn’t show is the horribly painful ripple effect suicide has on the relatives, friends, and even strangers left behind. A year ago, I sat in a church for the funeral of a 15-year-old classmate of my son, and watched tears run down the face of another teen boy who had barely known him. For unknown reasons, the child had taken his own life and left a community reeling in shock. The effect would have been no less if the boy had been handicapped; terminally ill; or had Down’s Syndrome. Instinctively, we know how precious life is. I regularly interpret for terminal cancer patients (who do not look glamorous or attractive as the characters in The Fault in Our Stars, by the way). These men and women cling to life with tenacity, wanting to spend every possible moment with their loved ones. This is humanity. This is putting “you” before “me,” not the other way around. Counseling any suicidal person (pre-emptively or remedially, after a failed attempt) is never easy, and their problems should never be minimized. This certainly applies to physically disabled individuals as well as any other depressed person considering suicide. But the truth is, most disabled individuals arenot depressed or suicidal, and they resent Hollywood’s condescending portrayal of them. Me Before You is a prime example of how far Hollywood has ventured from the sanctity of human life, and cries out for the truth of the Gospel (the Person and work of Jesus Christ) to give redemption and meaning to human suffering. The tragedy of films such as this is that they romanticize suicide; snub the Sovereign Creator; and reduce the moral and spiritual capacity of human beings to the level of animals. Recently, I was talking with two girlfriends after a Bible study. The subject came around to biblical reproof, and how we accept it from others. Recently, I published an article on the damaging effects of criticism and how it can embitter a person; today, let’s look at at the other side of the coin: confrontation of a specific sin or attitude, offered in legitimate love and concern. Although we like to think otherwise, we cannot view ourselves objectively. As my pastor says, “Scripture warns us that our heart is deceitful, and can trick us even when we think that our actions and motives are pure.” This is confusing, because we are in the best situation to know all the details of our circumstance better than anyone else. However, what we cannot see (particularly in painful circumstances which may be due to someone else’s sin) is that unresolved hurt and anger can easily lead to hardness of heart; cynicism; and ambivalence. Left to our own counsel, we may do what feels right or looks logical, without considering the harder commands of Christ. Because we are filtering our situation through experience, we feel perfectly justified. It is difficult for all of us to hear constructive feedback clearly, especially when strong emotions and painful experiences are mixed into the equation. With even a scrap of biblical literacy, we can easily find justification for what we want. And while we may be partially or fully right, we still may become embittered in the process and thus forfeit intimacy with God. We need the objective third-party view of a wise fellow Christian. Proverbs 27:6 reminds us that truly good friends are not those who simply tell us what we want to hear:“Faithful are the wounds of a friend, but deceitful are the kisses of an enemy”. A person who gives you feelings-based counsel is not a friend; nor is someone who advises you to run from your church at the first sign of conflict. As a very straight-forward person, I appreciate my close Christian friends who are going to speak truth into my life. Often, situations are less than black-and-white, and a wise person considers all angles before making a judgement. And yet, while we may solve the world’s problems over coffee, the admonishment of a friend does not carry the same weight of authority as that of a pastor. A good pastor will listen; understand; exegete Scripture with you; and may caution you in the same way as a friend – but his counsel may be more objective; and certainly more authoritative. The Bible talks about “confronting in love” and “rebuking”, but I honestly did not read this as a rebuke – rather, it was a diagnosis. Several friends had cautioned me to stay close to God; no matter how dark it got, not to let my heart grow hard; and similar things. But this was different. A perceptive observation from a truly caring (and patient) pastor helped me to see and want to deal with my own attitude more proactively. As my friend Kim said, “That’s why we need pastors. God knew that if we just judged ourselves, everybody would just ‘do right in his own eyes’ – God knew what He was doing when He established Church authority.” Of course this isn’t to say that churches never err, or that spiritual abuse doesn’t sometimes happen – but when leaders are truly motivated by love and concern for the members’ spiritual well-being, it is far less likely to be the case. How Does a Hardened Heart Feel? Do you feel misunderstood, maligned by those who love you? Have you experienced a loss of appetite for the Word of God? Do you experience feelings of anger, unforgiveness or self-pity on a regular basis? Are you having difficulty praying, especially for those who have hurt you? Of course, close friends or a counselor/pastor with whom we’ve been speaking might not even have to directly ask these “diagnostic questions” to know the answers. They can often diagnose our heart-issues before we can ourselves, but a friend may be reluctant to tell us their concerns. A trained counselor or pastor isn’t. How we receive that feedback becomes the deciding factor of what we do next; and if we do not believe that the counselor genuinely cares for us, we may resist his or her counsel and become further ‘hardened’. That’s why it is so important to establish trust. Even a child will not accept guidance from someone he doesn’t believe wants his best. We don’t like to be “broken”. On Sunday morning, we sing along with Hillsong’s Brooke Frasier “Break my heart for what breaks yours”; but we don’t want to really be broken. Being broken hurts. Having a soft heart allows it to be bruised; and after so much of that, we allow ourselves to grow callused and cold. The only ‘preventative medicine’ for a hardened heart is to stay close to Jesus, Who describes Himself as “gentle and lowly in heart” (Matthew 11:29). He has already given us the prescription: meditating on His Word day and night; along with seeking good counsel from godly friends and mentors (Psalm 37:30). Hearing the truth spoken in love and taking the time to seek God on it ourselves emboldens us to face our own short-comings without condemnation – and gives us the courage to act accordingly. Here in the United States, Protestantism has largely given way to a post-modern, liberal church where the “social gospel” is preached exhaustively. The term “born again” is usually taboo, as is evangelism (“the dreaded e-word”, as a church I once attended called it). The fund-raising pitches each Sunday often take longer than the feel-good humanistic messages, and week after week the flock is subjected to fund raisers and promotions of secular service projects. Before transferring to a Gospel-preaching evangelical church, I regularly witnessed Heifer Project, Habitat for Humanity and Crop Walk being pitched as “missions opportunities” or “outreach”. This is my background with “social justice”, and why the very mention of the words has long made me cringe. It is not that helping those in need is wrong or not a part of the Bible; on the contrary, Scripture is clear that we should do all we can to help others. The problem comes in when churches get out of balance in their teaching. All the humanitarian aid in the world is of no use spiritually if the Gospel of salvation is not being preached. Additionally, the oft-heard argument that “a hungry man will not accept the Gospel” is a myth, as the ever-increasing numbers of destitute Asian converts attest. Of course, it is equally possible to get out of balance in the other direction, too – when conservative evangelicals get so wrapped up in political agendas, church “fellowship” suppers and tract distribution that they forget God’s basic call to compassion. One pastor I know, who champions social programs and humanitarian aid projects under the label of “missions”, mentioned the polarization between the two extremes that needs to be balanced. “Traditionally, conservative evangelical churches have been criticized for not doing enough to help the poor…..feed the hungry, help the widow and orphan….while the liberal churches can be long on mercy but short on sound doctrine. Many in the ministry want to bring the two sides together to work in unity.” A noble goal, indeed. Another pastor, a charismatic whom I greatly respected, once made the comment: “You know….the liberal churches take a lot of flak for their stance on a lot of things, and rightly so – there’s much they’re doing wrong. However, there’s one thing they’re doing right, that we in the Pentecostal church have largely missed the boat on – helping the poor. Social action is a huge part of God’s heart.” While it is so common sense as to be a no-brainer, evangelism and works of mercy were never meant to be in competition – they are both important commands of God and are meant to complement each other. Several years ago, I completed John Macarthur’s “James” study with my church. Quite by chance, I began digging into Isaiah in my personal study to dig out the eschatological references. The first week, as I transitioned from my “James” homework into reading the first couple chapters of Isaiah, I noticed something interesting — there are several very specific parallels in those two books. It seemed like God was taking advantage of my attention span to drive home a couple of points about social justice – the term that made me shudder back at the UCC church. Besides calling us to live out our faith by helping others, both books indicate this does not happen in a vacuum. In both books, the expectation of charity to the oppressed is prefaced by a call to personal holiness. 2) Isaiah 1:17 echoes James’ call throughout chapter one to social justice. God is concerned with how we treat one another as fellow believers. As mentioned above, ONLY focusing on social justice to the extent that the Gospel is neglected leaves the impression that one can work his way into heaven by volunteering enough and helping the “needy”. We do have a very real civic responsibility in this world, but a call to compassion doesn’t exclude evangelism. It goes above and beyond it. James gives a discourse on what the balance looks like. God, speaking through Isaiah, simply lays it on the line as a command: 17 learn to do right! Seek justice, encourage the oppressed. Defend the cause of the fatherless, plead the case of the widow. 3) PRIDE. The age-old problem…and the solution spelled out so clearly in both books. Repentance, purifying your heart, washing your hands – and humbling yourself before God is a MAJOR parallel theme. All pride springs from the same root: thinking more highly of ourselves than we ought to, and placing our value on superficial things. He continues all through chapter 2 to forbid favoritism, as humans have a tendency to think more highly of themselves and each other judging by materialistic standards. One woman in my Bible study shared how shamed she had been made to feel when using food stamps in a well-heeled community’s supermarket. This is exactly the type of odious pride James is talking about, and flies in the face of the Christ-like compassion God expects of His people. Expository preaching is important, but a humble heart should be the result. “For even when we were with you, we gave you this rule: ‘If a man will not work, he shall not eat.” Not only is such an attitude selfish, it is patently unbiblical. Verses cannot be wrenched out of context to justify our own carnal meanness, and Paul’s condemnation of idleness (v. 11), laziness and “mooching” (vs. 6-9) in no way negate a Christian’s responsibility towards the brother (or sister) in lowly circumstances through no fault of his own. (Interestingly, the founder of the Bulgarian Communist Party, Georgi Dimitrov, used the phrase “He who doesn’t work shall not eat” as his party’s motto. My Bulgarian in-laws were quite surprised to learn that it was plagiarized from the pages of the Bible.) Communism is an evil, godless ideology; and is not at all what Paul and James were promoting. The concept of “noblesse oblige”, or moral obligation of the privileged charitably assisting the less fortunate, originated with Anglo-Saxon aristocracy. Today, while abuses of the welfare system have misconstrued the Biblical basis for this virtue in the minds of many, the American church remains head and shoulders above the rest of the world in this respect. The Gospel must be taken to the ends of the earth, and we in the West are indeed the ones with the burden of responsibility to make it happen. Our AWANA programs must be run, and we should be constantly in the Word in order to correctly divide and explain it (2 Timothy 2:15). However, this in no way lessens God’s call to relive suffering in the world. If we use our means to do so in His Name, we might find our tracts and evangelistic outreaches better received as well.